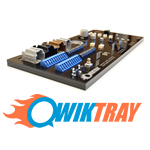 Count On Tools offers several styles of component handling trays based on industry proven specifications and the unique requirements of each product. Application requirements such as temperature and chemical exposure, manufacturing processes, mechanical and electrical constraints are factors which are combined with operation considerations including production volumes, build costs, total estimated usage and process control. From off the shelf kits to custom built tray products, rest assured that Count On Tools has the right fit for your next job. We produce top quality solutions for a global customer base. Our component handling solutions are capable of use from prototype to high volume production applications. We offer a variety of JEDEC outline carrier tape and custom matrix trays to satisfy the most demanding requirements of today’s electronics manufacturing service providers.